In Liberty City, a Fictional Counterpart to New York, you play a silent, nameless  protagonist who escapes from a prison transport and climbs the city's criminal ladder. You are hoping to get revenge your ex-girlfriend/partner in crime Catalina, who left you for dead after a bank robbery gone bad. It won't be an easy journey. Some will backstab you, and others will think you are in the way. But if you fight the good fight, this will be one hell of a ride. This game burst onto the scene in 2001, completely overhauling the series by bringing it into a 3D environment, popularizing the Wide Open Sandbox genre and turning Rockstar into its namesake. Although further games would add polish, few sequels deviate too much from this winning formula. Released on PlayStation 2, then on the Xbox and PC, and eventually got released on iOS and Android. Action Bomb: In the mission "Kingdom Come", the player is ambushed by drug-crazed madmen spawning from mook-making vans, complete with weird random chatter such as "Come to daddy!" and "I got a present for you!" Armed Blag: An early mission, and a Portland docks side quest. Batter Up: The baseball bat is the only melee weapon available in this game. Big Applesauce: Liberty City is based off of New York City. Bound and Gagged: Offscreen, but from what's said, it's really obvious. Broken Bridge: Played literally. The bridge to Staunton Island was blown up in the opening cutscene (thus justifying it in that case), the drawbridge mechanism on the bridge to Shoreside Vale was broken, and the tunnel connecting all three islands was still under construction. Brooklyn Rage : A large portion of the cast, including the protagonist. The Cartel: Arguably the main antagonists of the game. Central Theme: Betrayal and revenge drive not only the plot, but also the missions. Claude is apparently motivated by his desire for revenge against Catalina. Salvatore Leone is paranoid about his underlings betraying him (and rightly so). Donald Love gets the player to betray Kenji. Chronic Backstabbing Disorder: Catalina, of course. This also applies to Claude, given the sheer number of times he shifts allegiance from one gang to another. Corrupt Corporate Executive: Donald Love. Crapsack World: "The worst city in America" indeed. Gangs turning hostile towards Claude, one of which is already hostile (and only two gangs won't attack him on sight). Liberty City also houses a corrupt mayor, backstabbing mobsters and a dreary environment. Deadly Game: Liberty City Survivor, which is advertised on the radio in III. The ad, complemented with fan footage from IV, can be listened to here. Dirty Cop: Ray Machowski. He has plenty of contacts in the Liberty City underworld, and even introduces series staple, Phil Cassidy. Face Heel Turn: About a third of the way through the game, Salvatore Leone sends Claude to pick up a car that he's had rigged with a bomb in an effort to kill him. False-Flag Operation: In a bid to drop real estate prices, Donald Love has Claude start a gang war by assassinating The Yakuza crime lord Kenji Kasen, for whom Claude had previously worked as an enforcer and then framing The Cartel. See Lost Forever below. Fan Nickname: Due to being ordered around for the entire game, before his real name was revealed, Claude was referred to as "Fido". Also, Maria refers to Claude as "Fido" when he is ordered by Salvatore Leone to be her driver. Guide Dang It: A few of the missions are tough as hell unless done a certain way, and the game gives no hints to those methods. "Heroic" Mime: Even if Claude isn't quite a hero. And apparently he's a literal mute, too. Hey, It's That Voice! : The first GTA game with a name-actor voice cast, each one known from cult crime movies and TV shows, including Frank Vincent (Goodfellas), Michael Madsen (Reservoir Dogs), Joe Pantoliano (The Sopranos), Robert Loggia (Scarface), Debi Mazar (Goodfellas), Michael Rapaport (True Romance) and Kyle Maclachlan (Twin Peaks). Hufflepuff House: The Yakuza has frosty relations with the Cartel, particularly once you frame Miguel for killing Kenji. Claude, being Claude, ends up drawing the ire of the Yakuza anyway. Incredibly Lame Pun: "Give Head radio a listen this weekend, it'll blow you away." Lost Forever: Some Portland missions need to be done before you leave. Also, Kenji will get killed at a certain point, so you need to complete his missions before then. Mafia Princess: Maria, although this is her at the tail end of that life. 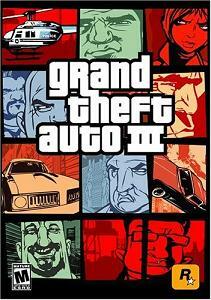 A New York City stand-in by the name of Liberty City first appeared as the setting of the first GTA. A "Claude Speed" resembling the Claude of III appeared Grand Theft Auto II 's live action intro. The Zaibatsu Corporation, here reduced to a pharmaceutical group with a few buildings and radio ads, was an employer in all zones of Grand Theft Auto II. Both of the previous games included a radio station named "Head Radio." New York Subway: The Portland Island El, and the Liberty City Subway itself is based off of the New York City Subway. No-Gear Level: The final mission. Retired Badass: You'd never know it just from this game, but just three years before Claude met up with him, Toni Cipriani was every bit as crazy and murderous as him. Rewarding Vandalism: This was the last GTA game where smashing into/blowing up cars earned money on its own. Small Role, Big Impact: Nothing in the game would have happened were it not for the "Old Oriental Gentleman" and the Cartel freeing him from the police transport, which also allowed you to get free too. Shrug of God: Did Claude shoot Maria? "No one knows for sure what happened there" is the official line. Title Drop: A notoriously difficult mission, where you must steal 3 cars and deliver them to the Yakuza within 6 minutes and without a single scratch, is called "Grand theft auto". Too Soon: After 9/11, Rockstar North changed the paint jobs on the police cars so that they didn't resemble those of the NYPD. Some pedestrian dialogue was also changed. There was insufficient time between the disaster and publication for extensive alterations. Twist Ending: Claude (apparently) shoots Maria after rescuing her, because she won't shut up. It's never stated if he killed her, or if he just fired a warning shot into the air, so it's left up to the gamer's imagination. It was finally "stated". God said "Certainly gun shots were fired but nobody is exactly sure as to exactly what happened." The Voice : The leaders of three gangs each situated on one of the three islands in the city call you via pay phone and have you run errands for them. At no point in the game do you actually get to meet them. In Portland, you are contacted by El Burro of the Hispanic Diablo Gang. When you reach Staunton Island, you are contacted by King Courtney of the Jamaican Yardies. After unlocking Shoreside Vale, D-Ice of the Red Jacks gives you a call. What Could Have Been: Originally there was going to be children, school buses, elderly people with walkers, the ability to blow off limbs, as well as a hobo anarchist-terrorist named Darkel, who was still in the plot long enough to get his voice actor credited in the manual. Some of his missions include distributing ice cream that was effectively a bomb, blowing up a school bus full of children and flying a plane into a building to kill one person. Actually, according to a recent Q&A on the Rockstar website, they revealed that Darkel, and all his missions were removed long before 9/11, because "...they just weren’t as good as the rest of the game, and tonally they were a little odd." They also add "None of these missions involved blowing up buses of school children." And for good measure "All of the more extreme rumours are amusing but impossible to have been achieved in such a short period of time." What Happened to the Mouse? : Donald Love will simply disappear when the mission "Decoy" is finished. The only thing he leaves behind is an empty box. Although you unfailingly see a plane flying away during the cutscene where you wonder where he's gone. It can be assumed that he's on it. Writers Cannot Do Math: An Ad Bumper for Head Radio calls the station "the rock of Liberty City for sixty years". This would mean they started out in 1941, Rock & Roll wasn't invented by then. This becomes a Running Gag in Vice City (set in the 1980s), in which Lazlow, there the DJ of the rock station V-ROCK, claims the station has been around for seventy years. This page was last edited on 17 July 2018, at 03:15.